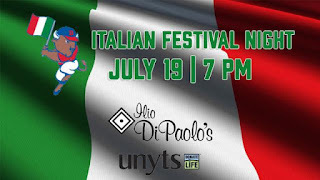 Home / baseball / Buffalo / Buffalo Bisons / CM / Daily Update / italian heritage night / schedule / Sports / Thursday: Celebrate Italian Heritage Night with Bisons tent party, fireworks! Thursday: Celebrate Italian Heritage Night with Bisons tent party, fireworks! BUFFALO, N.Y. -- A fan-favorite favorite every year at Coca-Cola Field, the Bisons will once again celebrate Italian Heritage Night on Thursday, July 19, presented by Ilio DiPaolo's, Unyts and Dessert Deli. GET YOUR TICKETS for the Bisons game against the Durham Bulls (7:05 p.m.) that night, and make sure you get to the ballpark early for all the festivites. Italian Heritage Night will actually begin at 5:00 p.m. with a special pregame Tent Party. Enjoy live music from Lou Mistello as well as great food specials to fill you up before the big game. There will be Italian sausage sandwiches ($5) or dinner plates with stuffed shells ($8) and garlic bread to choose from (pregame only). Then, fans can take their seat and enjoy a great Bisons game against the Bulls and fantastic postgame Fireworks Show, presented by Unyts. For more information on the Bisons Heritage Night Series, as well as other community nights, CLICK HERE.